Until fairly recently, I owned a small farm where I raised chickens and the occasional pigs. As adorable as piglets might be when you first get them and can pick them up by a hind leg, they soon become good for one purpose only: feeding them out to a size suitable to be transformed into pork chops and assorted other foods. My pigs doubled as garbage disposals. If we had leftover dinner that wasn’t going in the fridge, we’d give it to the pigs. If some produce went bad on us, the pigs got it. When I’d stumble across a clutch of eggs that the chickens had secreted in the bushes, the pigs received a raw-egg treat. They’d also eat grass and leaves and trimmings from the garden. But to get my pigs to 250 pounds as efficiently as possible, most of their calories came from 50-pound bags of feed, little processed pellets of who-knows-what that I bought at the local feed store. The feed I typically bought was called Muscle Pig and trumpeted 16% protein. The pigs ate it with abandon and enthusiasm. Recently, I’ve been reflecting on Michael Pollan’s famous dictum: “Eat food, not too much.” Pollan goes on to add that most of our food should be from plants, a determination that we could question, but I’d like to focus on the “eat food” part. We can eat food or we can eat feed. Food grows on trees or plants. It can be obtained from animals. Feed, on the other hand, comes from factories and is enhanced by the marvels of modern chemistry. The feed that I gave my pigs was extruded. That is, it was squeezed out of a press, like the old Play-Dough Pumper. 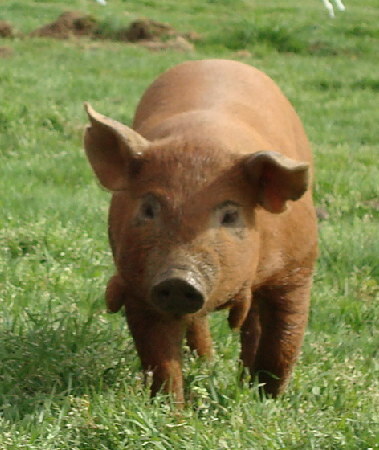 Feed, as it relates to pigs, is designed to put weight onto the animal. Even in the case of a non-meat animal–a horse, for example–feed exists to make the animal useful to someone else. Can that apply to humans? Human feed typically makes people useful to corporations by producing a profit for them. Food, however, is more than feed. It does all the things that feed does, including making a profit for food providers, but it does more. It nourishes. It strengthens. It delights. It blesses. As much as you might enjoy Fruit by the Foot, you can’t honestly say that it is a blessing, can you? Think about a food that says “home and happiness” to you. I’m guessing that it’s not extruded. I’m guessing that it doesn’t come from a factory. Yes, it might be processed, but it’s probably processed in a kitchen rather than in an industrial plant. Eat food, not feed. Feed is for pigs, and pigs are food.